Travis Ross, Brandon Kuykendall, Pat Sullivan, Chris Hoffman and Kyle Colletti. 1,900 firefighters from eight countries participated in the 26th annual Scott Firefighter Stairclimb at Seattle's Columbia Center on Sunday, March 12, 2017. 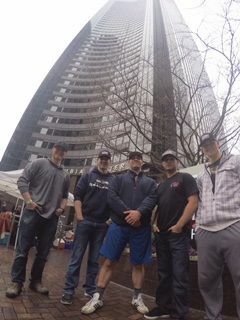 Firefighters ran and walked the 69 floors of stairs and 1,356 steps after raising money to benefit the Leukemia and Lymphoma Society which funds research and patient services for leukemia, lymphoma, Hodgkin's disease and myeloma. Each participant had to raise at least $300 in order to participate. The teams raised money through sponsorships, individual and department fundraising, and entry fees. This is the largest individual firefighter competition in the world. The race was done in FULL structural firefighting gear: boots, pants, and coat (liners intact), helmet and gloves. Breathing apparatus was worn and USED every step of the course. Top racers finish in as little as ten or eleven minutes, while the average participant takes about 20 to 30 minutes to finish. 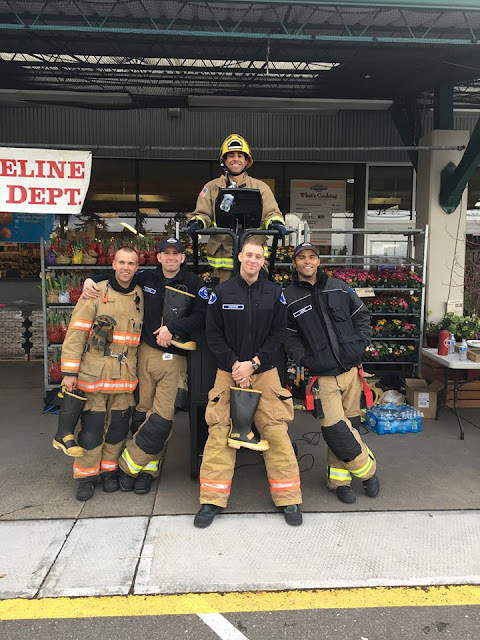 Northshore Fire said "Great job to everyone that participated in the annual Scott Firefighter Stairclimb this weekend and great job to our Firefighters." Shoreline Fire had seven climbers. "Mark Merlino had the fastest time up the 69 flights in all the gear (adding 50-70 extra pounds) in 14:47 minutes! Mike Mentzos, Keenan Miles, Moses Cochran, Terrance Lewis, Amanda Brassfield, and Justin Hansen." Participants have until Friday to turn in the money they have raised, but all are hoping the event will surpass the $2.3 million the event raised in 2016. The race results are here - fascinating to read for the places they come from and how many people they sent. The Firefighter Stairclimb was started by Shoreline firefighter David Engler. Here's his story.